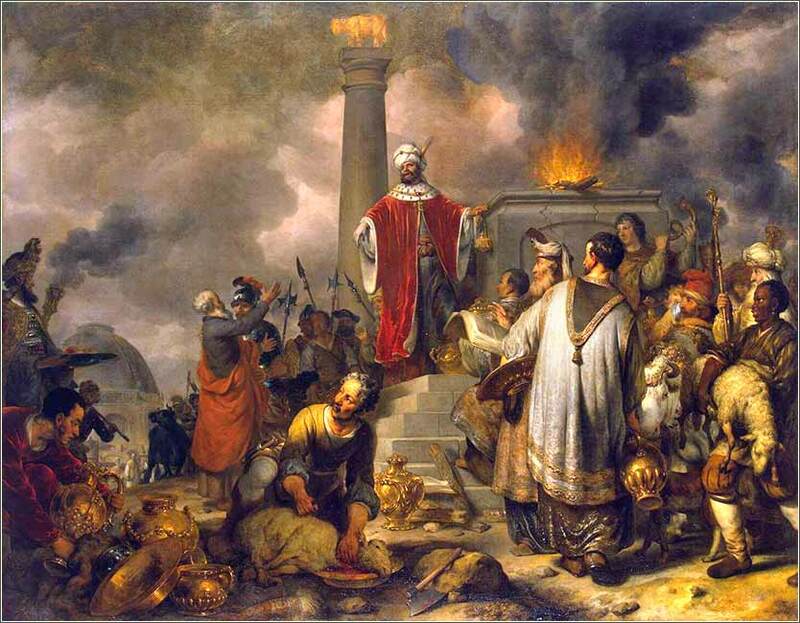 Jeroboam Sacrifices to the Golden Calf by Gerbrand van den Eeckhout, ca. 1656. This is the first Jeroboam, the initial King of Israel after the kingdom divided, who built the two golden calves that would, eventually, lead to the utter destruction of Israel. 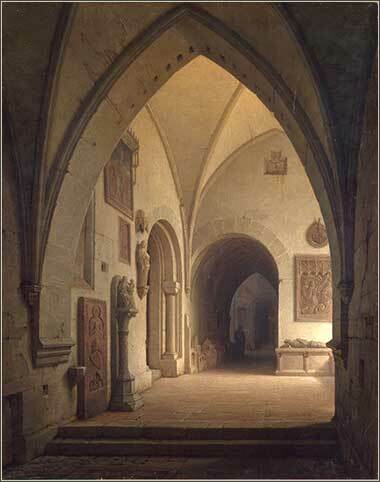 Interior of a Church by Max Emanuel Ainmiller, ca. 1860.
in Chapters 1 to 3 of Hosea, he provides a visible symbol of the broken relationship between God and the people of Israel, the ten tribes in the Northern Kingdom. At the end, Hosea finds and redeems Gomer, buying her back to be his wife; a message of hope to the Hebrews that God might someday forgive them. The remaining 12 chapters are long, somewhat disjointed and sometimes difficult to follow unless one wants to really invest a few hours to read them thoroughly. Most people will choose not to and, indeed, with good reason. There are many parts of the Bible to study, and most of them are more profitable to growth in faith than the enormous body of prophecy. Most of the prophecy states one basic message in 1,000 different ways: The Hebrews have forsaken God by worshipping idols and He is going to punish them for it, by destruction of their kingdoms. Repent and turn back to God. Then, in a much smaller number of verses, there is the promise of a Messiah who will effectuate their redemption. There are two famous passages from Hosea. First, the phrase, “For they sow the wind, and they shall reap the whirlwind.” As a famous quote in popular culture, it has lost some of its impact in the past 100 years, but it is still recognizable to most educated people. Second is the sentence, “For I desired mercy, and not sacrifice; and the knowledge of God more than burnt offerings.” (Hosea 6:6, KJV) This will ring a bell with most Christians, because Jesus quotes it, twice in Matthew and once in Mark. (Matthew 9:13) It sums up a primary point of His teaching in His early ministry; that love and faith in one’s heart, not the empty formal practice of religious ritual, underlay even the law of Moses. It is His criticism of the Pharisees, the way in which He shows them how they have gone wrong, even under the Old Covenant. Hosea has one peculiarity: He uses the tribe of Ephraim, the largest and most powerful of the ten tribes in the Northern Kingdom, as his whipping boy. It is a synecdocheA synecdoche is a specific kind of metaphor, in which a part of something is used to represent the entirety. The expression “hired hand”, for example, is meant to represent a person, not just his hand. : where we read “Ephraim” we are to understand that he is talking about the entire Kingdom of Israel. Also finally, you might have noted the phrase, “He will raise us up on the third day,” a prophecy of Christ. 2 Corinthians 12:9: Your grace is sufficient for me, for Your power is made perfect in weakness. Therefore, I will boast all the more gladly in my weaknesses, that the power of Christ may rest upon me.